A Pop Up for guys, gals and skateboarding fans. Come watch the most fun skateboarding race and the only legal garage race in the Country. 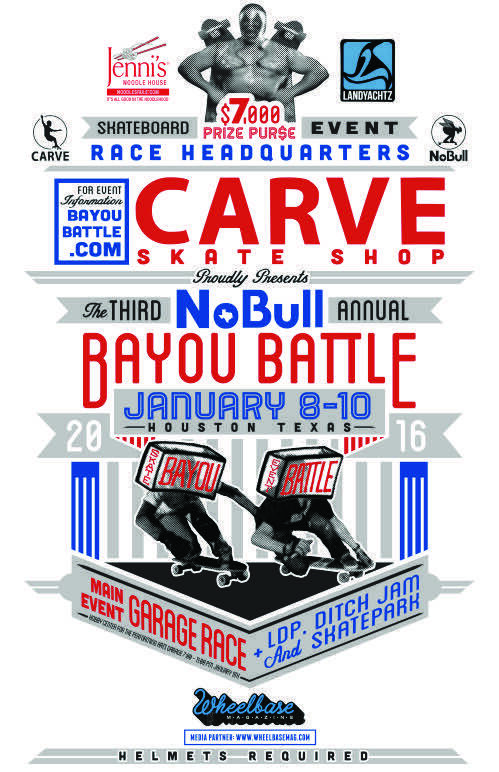 Skaters from all over come to Houston to battle it out. The pop up will feature local artists will tons of cool products and lots of fun things to keep you having a good time at the race. Located in the heart of downtown Houston this 9-story concrete behemoth is perfectly suited for a garage race. With super wide lanes and a bomb out finish this racing venue is ideal for 6 man heats with enough floors to make it anyone’s race. Houston’s style of physical racing means position off the line is critical and your ability to draft, grab, regrab and pump makes the difference between first and last. The Hobby Center For The Performing Arts garage is a gorgeous facility and ironically when not used for the Bayou Battle is the “hottest” garage in Houston for getting busted. One day a year it is available for the skating community to enjoy, it is Houston’s Maryhill.